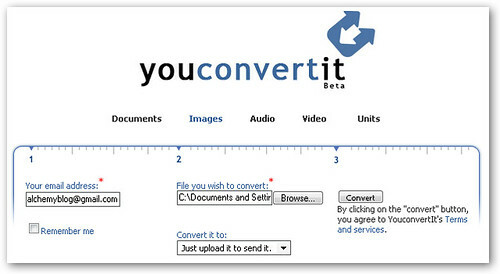 YouConvertIt is a nicely designed file conversion site that lets you take one kind of file and change it into another. Documents, images, audio, video, and even units are supported. To get started, choose the type of file you want to convert, then enter your email address, browse to the file's location on your computer, and choose what file format you want to get back. A unique option also lets you use YouConvertIt as a file storage service. Make sure to leave the "Convert it to" field as "Just upload it to send it". Then just enter the email address of the person you want to transfer the file to, and he or she will get a download link in their inbox. Related: Check out Media Convert for an even more comprehensive file conversion site.